Ivica Kostelic is on the climb in the world rankings and a good bet to pick up an Olympic medal at Vancouver, where he will put his experience and talent on show in what promises to be an enthralling Alpine skiing competition. With his illustrious sister Janica, now retired after becoming the best female skier in the world during a glorious era, Croatia are now looking to Ivica to continue his steady improvement which culminated with a career best fourth overall in 2009. To date, his finest hour was in 2003 at the Saint Moritz world championships when he took gold in front of Austrian duo Benjamin Raich and Manfred Pranger. That win made him the first Croat man to win a world championship although he suffered the disappointment later in the campaign, when he missed out on successfully defending his 2002 slalom crystal globe by a meagre eight points to Finn Kalle Palander. Those were his early glory days after making his World Cup debut in 1998 at Solden and making his world championship debut in 1999 with a modest showing at Vail. Meanwhile Janica was picking up the first of her 30 World Cup victories at Sankt Anton as she went on to finish her career with four Olympic golds and five world titles. 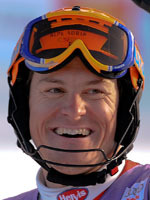 Knee injuries hindered his progression until his breakthrough in 2002 with the first of two World Cup wins and the slalom title. However on his Olympic debut at Salt Lake, he fell during the second leg of the slalom and had to settle for a Croatian best of ninth in the giant slalom. In 2004, the season after his world gold, injury struck again with ruptured knee ligaments in a nasty crash at Schladming. But he got back to top form the following season and went to the Turin Games in 2006 full of optimism. Kostelic became the first Croat man to win an Olympic skiing medal and was visibly delighted to take silver behind American Ted Ligety in the combined. The 2007-08 season also produced great performances and his ability to pick up points in five disciplines helped him to a career best sixth overall. Agonisingly in the pre-Olympic 2008-09 season, back problems robbed him of another slalom globe as he settled for second behind Frenchman Jean-Baptiste Grange. On top of that after flirting with the overall title, he settled for fourth in the race for the biggest globe and fourth in the combined. His progress has been encouraging as he heads into what could be his best ever season, which of course will be built around the prestigious Olympic races at Whistler.